l happens, absolutely guaranteed. There will be days when your motivation and will power will wane, you are tired or sick, or you just don’t have the time or energy to even think about good choices, much less actually make them. In those moments, if you don’t have a plan, you WILL default to the lowest common food denominator. The 7 Day Meal Planner is one of the most powerful tools you have. Meal planning can feel overwhelming. Not anymore. All you need to do is decide on 7 meals. This will take care of all the dinners and lunches for the next 6 weeks. Decide what you will have on Sunday for dinner, and for the next 6 Sundays, you will have that same dinner. Decide what you will have on Monday for dinner, and for the next 6 Mondays, you will have that same dinner. Do this for each day of the week and you have the entire 6 weeks of dinners planned. Each dinner, you make just enough for lunch the next day, and now you have taken care of every lunch for the next 6 weeks. For each dinner, make a shopping list of things you will need to buy. You only shop once per week and only purchase the foods you need for that week. Now you will not be stuck without the ingredients you need and you won’t have purchased foods that will tempt you. For overall fitness, we should consider all the pieces that we focused on in this adventure. 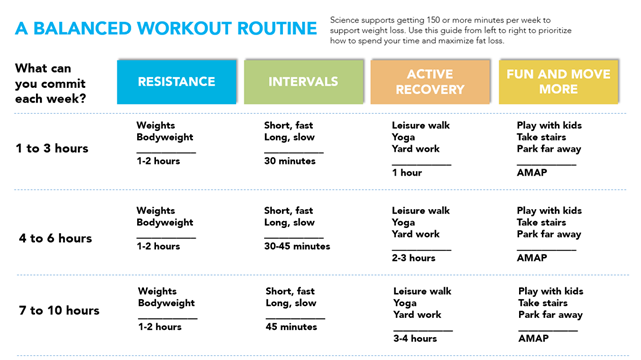 Blue zone time, orange zone time, intervals, strength training, active recovery like yoga and walking. You decide which of these you will include in your weekly routine (ideally all of them but that is up to you). Then you decide which days you will do what. Viola! You have a plan. Here is a single page that can help guide you to creating your plan and prioritizing your time.